Phase Control Modification circuit for the LER Servo Driver cabinets and successfully tested its operation. This will be critical if we were to loose just one phase of power. One of the other E. techs and a programmer from one of our partners in Germany have started working on the VIRUS enclosure PLC for monitoring the sensors within the enclosure. They tested each sensor and mute switch; all worked as expected. End to end testing will be done next week. 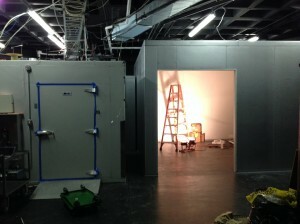 Meanwhile the mechanical team worked on the Platforms for the first Virus Enclosure. It took several days but all of the platforms are now in. the telescope operator was able to find all of the mirrors (with some assistance of the mirror team who sited some of them in from the catwalk). Mirror alignment for the full array is now near 0.5″. Work continues on the commissioning of the strip and wash room. We finished working on the PID control of the strip/wash room exhaust fan. Fan will now respond to pressure setting change requests from within the strip/wash room and regulate the pressure to previously established set points. This will allow the team to switch from positive pressure while washing or drying mirrors to negative pressure when doing acid stripping. We reviewed spectrograph room temperature data and discovered that we have dropped below the cooling temperature settings of the Mitsubishi thermostats/control heads, this is largely due to the thermal pulse moving through the ground produced by our <20 F temperatures last week. We have designed a new experiment to determine the optimum method to hold the 16 C setpoint during periods where both heating and cooling are required. We hope this new methodology will work. If not then we will need a PID controller which will require significant more work. This entry was posted in WFU on November 22, 2014 by shetrone. 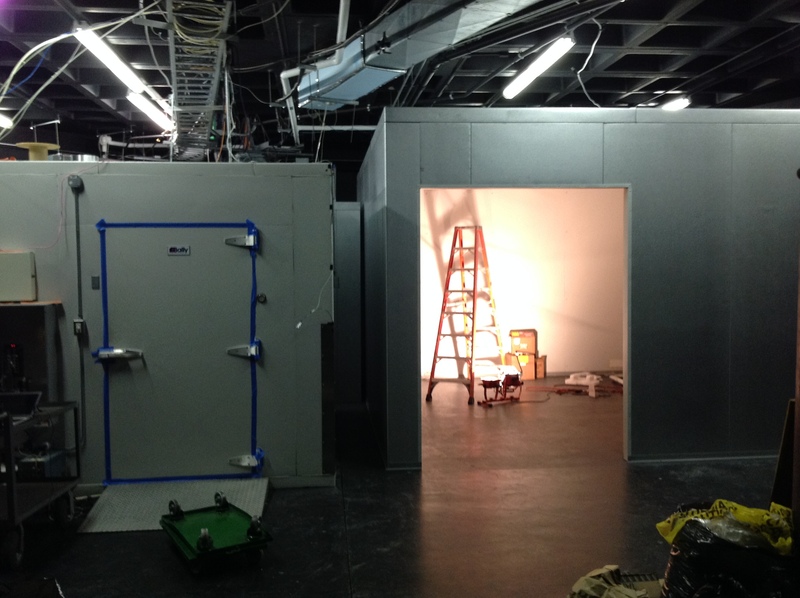 The biggest change the occurred this week was the completion of the HPF enclosure. A team came out from Penn State to lead the efforts and after two days the enclosure was completed and the last day was spent wiring up temperature sensors to monitor how the systems reacts to seasonal changes in the HET basement. Newly installed HPF enclosure next to the HRS enclosure. Our electrical team completed hook up of power cables to distribution boxes in Virus annex this week. They hoisted and installed the Virus equipment rack in the annex as well. We hope to have all of the electrical work done for the first enclosure by the end of next week when a programmer comes from Austin work work on the PLCs. This week we found a problem with loose screws on lower X. We shut the tracker down for the week and an engineer came out from Austin to inspect the system for any damage. He found that many of the screws were loose and some of the shims were missing. This was likely caused by a fairly strong vibration incident that we had when we were commissioning the TCS timing loops. The engineers and mechanical team got the X drive shimmed and aligned again and all of the crews have been tightened down with torque wrenches. While the engineer was out here he worked on the rho stage which was hitting the proximity sensors early due to the non-flatness of the switch plate. They re-installed it with shims to adjust flatness and installed RHO limit switches and set the clearance. The initial commissioning of the Strip and Wash Room began this week. A mirror segment was put through the new ultra-pure water cleaning. It is not entirely surprising that a number of small leaks were found around the mirror and passage way doors. The rest of the week was spent finding leaks and diverting water drainage paths. Our electrical engineer has nearly completed the PID controller and pressure display that will show when the room is in positive pressure and negative pressure. As an interesting diversion this week we had the Director on site with several photographers taking pictures of him and the facility. Some of the shots were done from a helicopter while others were done from various catwalks or man-lifts. We all look forward to seeing these glamour shots. This entry was posted in HPF, WFU on November 15, 2014 by shetrone. The in-line fans for the K-hut and Strip and Wash room are now in place and working. This means that we can begin the process of commissioning the strip and Wash room. At the moment we still need a few more safety indicators on if the room has negative or positive pressure and to get the hot and cold water nozzles in place. This work seems to be moving forward at a good pace. The replacement of the old truss sensors is moving forward. As mentioned before the old sensors have been removed and the new ones are being assembled. Lift 3rd VSS platform into place, test fit, secured in place in prep for install. Moved upper VSS platform into bay area, painted modified area and moved onto dome floor. Work around the VIRUS Support Structure (VSS) continues. We have made some modifications to the work platforms and three of those have been test fit, secured in place and in preparation for the installation in two weeks. This week we did some work on possible coupling between the VSS and the structure. Our concern was that wind shake on the VSS would cause the mirrors to move. We did a number of test at the CCAS tower involving people physically moving the currently empty VSS enclosures. The concern seems to be warranted as the FWHM of the induced movement is about a quarter of an arc-second. We will look into identifying the members that cause the most coupling between the two and mitigate the motion. The software team out here has been working on the DMI and Tip/Tilt to get it realigned with the new mount models that were installed last week. The big news this week is the arrival of the HPF enclosure. Despite some very thick fog and misty rain we were able to get the truck unloaded and placed in the spectrograph room without tearing up the newly prepared floor. The PSU assembly team will arrive late next week. This entry was posted in HPF, WFU on November 7, 2014 by shetrone.